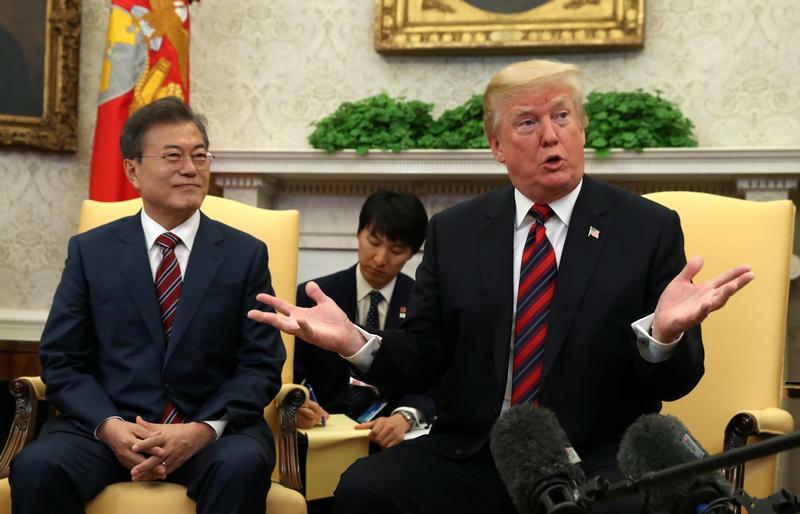 U.S. President Donald Trump gestures as he welcomes South Korea's President Moon Jae-In in the Oval Office of the White House in Washington, U.S., May 22, 2018. A third summit between South Korean President Moon Jae-in and North Korean leader Kim Jong Un is planned for Sept. 18 to 20 in Pyongyang. Thomas Byrne is president of nonpartisan The Korea Society in New York City and formerly regional manager for sovereign risk in Asia-Pacific and the Middle East for Moody’s Investors Service. Thomas Hubbard is chairman of The Korea Society and served as U.S. Ambassador to the Republic of Korea from 2001 to 2004.